Here in Kansas, we are the EPA Regional Office that is farthest from an international border. But surprisingly, we still get our own share of out-of-town visitors. 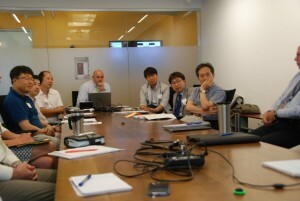 In August 2015, scientists from our Drinking Water Program and Environmental Science and Technology Division sat down with five South Korean representatives from Kunsan National University, the National Institute of Environmental Research, the Korea Environment Corporation, and the country’s Ministry of the Environment. Dr. JeJung Lee, who is our partner in the very cool KCWaterBug, helped arrange the visit and assisted with translations where necessary. What was truly fascinating, yet I suppose not altogether surprising, were the issues we talked about. This group of scientists from across the Pacific wanted to learn more about how our Agency protects and regulates groundwater in the United States. 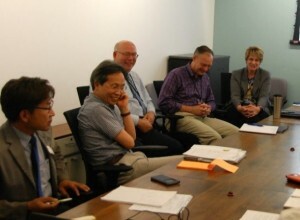 They also met with staff at the Kansas Department of Health and Environment, the University of Kansas, and the U.S. Geological Survey. As it turns out, many of the issues they grapple with are, in fact, the same ones we deal with here in the Heartland. We first talked about nitrate pollution. Here in the United States, nitrate is regulated in drinking water at public water systems, with a maximum contaminant level of 20 parts per million, which is rarely exceeded. South Korea has many more private wells in urban areas, while nearly all individuals in metropolitan settings within the United States get their water from regulated public water systems with protected water sources. We learned that sampling at residential homes is difficult for them to accomplish, because homeowners are afraid of losing the ability to use the water or are fearful that they will be required to pay for treatment. On the remediation (hazardous waste cleanup) side, our visitors were interested in chlorinated solvents and the concerns and risks associated with the vapor intrusion pathway at sites with volatile organic compounds. A specific area of interest was methyl tertiary butyl ether (MTBE), a gasoline additive that used to be prevalent in the United States, and its associated vapor intrusion concerns and risks. On this day, EPA did most of the talking. 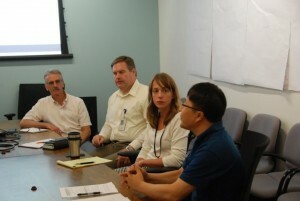 It would have been nice to have had the time to hear more about how South Korea regulates groundwater nationally, especially private water well use and construction standards, as well as their experiences with water treatment processes and techniques for drinking water and wastewater. Unfortunately, they had a busy schedule and were sprinting over to the University of Kansas to meet with professors, before moving on to Tennessee to meet with staff from the U.S. Geological Survey. We will just have to wait for another visit. As you can see in the photo, even with the language differences, we managed to share some laughs! About the Author: Jeffery Robichaud is a second-generation EPA scientist who has worked for the Agency since 1998. He currently serves as Deputy Director of EPA Region 7′s Water, Wetlands, and Pesticides Division. Jeff’s journeys across the Pacific have always stopped just halfway across, and he hopes to someday cross the International Dateline and visit friends in the Far East.